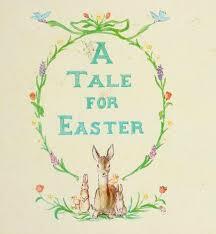 A Classic Easter Picture Book Title Not to Be Missed by Young Readers! Softly tinted trademark drawings, enhanced by a dreamlike quality, are the hallmarks of this classic 1941 Tasha Tudor tale of a young girl’s run up to Easter. Ms. Tudor, known for her pastels celebrating the joys of her rural childhood, beginning with her 1938 Pumpkin Moonshine, with its family-centered celebrations, and the winning of two Caldecott Honor book designations for Mother Goose in 1945 and 1 is One in 1956, continues here, with family-centered freshness in A Tale for Easter. Ms. Tudor spent her life as an artist celebrating the wildlife, landscape and traditions of her own childhood. And through her ninety some books, she has shared it with generations of readers that perhaps, by osmosis, long to soak in a simpler time and place that this artist captures with both sweetness and an unashamed sentiment. There is a childlike happiness and quiet calm in this young lady’s unfettered and innocent view of the burgeoning new life that surrounds author, Tasha Tudor’s look here at spring, and the holy day ahead. My very favorite part is the dreamlike sequence in which the young girl has the “loveliest of dreams,” with a wee fawn conveying her lightly on a springtime journey, taking in looks at leaping lambs, restful rabbits, gamboling ducks, and a host of tinted yellow, spring blossoming flowers. If this was indeed what Tasha Tudor’s rural New Hampshire childhood was like in 1941, perhaps we need to allow our own children an imaginative picture book look back to a simpler time when the arrival of spring, its celebrations of new life abounding in nature, and the family traditions surrounding the observing of holy days, may be looked at again with the fresh eyes of a new generation of readers. It’s a classic Easter read not to be missed.